MetalRockNews: Papa Roach's Jerry Horton: "We'll probably start writing new album in February"
Papa Roach's Jerry Horton: "We'll probably start writing new album in February"
Papa Roach guitarist Jerry Horton was recently interviewed by Metal Wani, you can read some excerpts below. 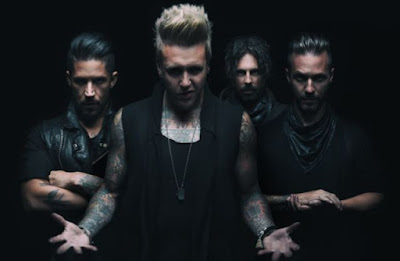 About if Papa Roach will continue to incorporate electronics into its sound on the band's next album, Jerry said: "I don't know if we'll necessary keep as much of the electronics. I think we'll do it where it's appropriate. But the mindset behind it has been just kind of having overdubs not be guitars, so that it's kind of a distinct instrument." He continued: "We have talked about possibly simplifying stuff for the next album, just making the sound as huge as possible… I mean 'huge' in terms of heaviness, maybe some, maybe just not having so many layers, so that the individual instruments… Making the sound more simplified." About the progress of the songwriting sessions for Papa Roach's new album. He said: "We have started writing a little bit, just little riffs here and there. I don't know about actual recording, but we'll probably start writing in February."